Creating and editing your Online Store with Square is easy – no website building experience necessary! The Online Store is optimized to sell tickets, services, items, and even accept donations. All Online Store sales have a per transaction fee of 2.9% + 30¢. That’s it – there are no monthly fees or other costs for hosting or listing your store. If you completed sales through your Square Online Store before March 31, 2016, the promotional processing rate of 2.75% per online transaction is valid through June 30, 2016. Sign in to Online Store in your Square Dashboard and click Get Started. Pick a theme: Select a theme that matches your desired layout and brand. Verify your business information: Your existing business info will be imported into your Online Store, but you can edit this anytime. Store URL: Your store’s URL will automatically generate as squareup.com/store/your-store-name, but you can change this. You can also connect your store to a domain you already own. Shipping settings and return policy: If you plan to ship orders, customize your shipping settings. To set clear expectations for your customers, add an online return policy. Customize your store: You’ll land on Site Editor where you can customize and launch your store. Add images and sections to show and sell items, tickets, donations, or any combination of the three. Launch! To make your store live, click Launch from the Site Editor. Navigate to your Online Store. Select Site Editor > hover over Items. Click Add or Import Items > Select Import from Library. Select the item you would like to add to your store. After launching your store, you can go back and edit your theme and store settings at any time. Atlas: An all-purpose layout to get merchandise online quickly. This theme most closely resembles the layout of the old version of the Online Store. Roebling: A simple layout that balances text and imagery. Market: A clean, simple layout that emphasizes images. Downtown: A dark palette design that provides interesting contrast. Good for large inventories. Note: To switch themes, click Change Theme at the top of Site Editor. Your current store content will automatically transfer to the new theme. Each theme comes with editable sections. Hover your mouse over a section to see your options. To make sure your images fit properly, review the recommended image specs in the table below. If you need assistance editing or formatting images, check out Canva. Note: Once 100 items have been added to a section, the ability to drag and drop items within the section isn’t available. You can create another section to reorder additional items as you’d like. Visit the Site Editor and scroll down. Click on the location and contact sections to update your information. Note: If you’d rather not show your address or location on the map, leave those fields empty. To add a Facebook, Instagram, Twitter, or Pinterest link to your store, click on the social links section and add your information. Note: If you haven’t created a username for Facebook, Pinterest, or Twitter, do so before adding this information to your Online Store. Business hours show customers when you’re open, and are required to sell items for pickup. Manage your business hours in Store Settings. If you open and close throughout the day, you can add a separate line for each shift. Selling sections are a way to group goods, services, events, or donations. To get started, go to Site Editor, hover your mouse over Add Section, and choose a selling type – Events, Goods or Services, or Donations. You can add any combination of the available selling types. Click Events from Site Editor in your online Dashboard. Above “Add or import events,” click the + icon and add the event details. Under Ticket Details, add the ticket name (e.g. General Admission, VIP, etc. ), price, and the number available for sale. Add any applicable tax rates. If you need to create a new tax, visit Items from your online Dashboard. Select the delivery methods customers can choose from. The electronic option will work best for most cases. Electronic: Email your customers a confirmation of their purchase, which they can use to get into the event. Shipping: Mail tickets using the delivery service of your choice. Pickup: Have customers pick up their tickets at will-call, before or at an event. Repeat the steps above to add multiple events. Note: The delivery options you set will dictate the next steps you’ll need to take to fulfill the order. Learn more about managing ticket orders. Click Donationsfrom your online Dashboard and add the donation details. Select Allow Custom Donation Amounts to let donors contribute the amount of their choice (up to $1,000) and add suggested donation amounts. 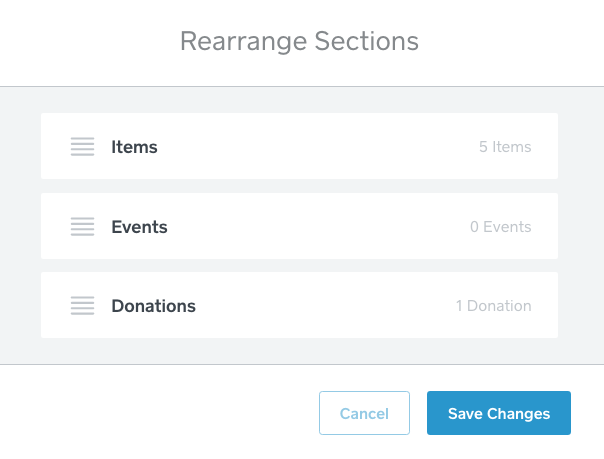 You can add multiple donation sections to your store – just repeat the steps above. For example, Sunnyside middle school currently has two campaigns – one to raise money for a new science lab and another to help fund the school play. They’d follow the steps above twice, once for each campaign. When a donation is made, both you and the donor will receive a confirmation email. You can export a list of your donations and donor information anytime. Click Goods and Services from your online Square Dashboard and hover over each text box to add the section details. Click Create New Item and enter the details, or click “Import from Library” to select the items you’d like to import to this section. Make sure to choose the delivery methods for each item. You can create multiple item sections. For example, Blair sells homemade jam and honey. She’d like jam and honey options separated on her page. Blair would need to set up 2 item sections – one for honey varieties and another for jam. She’d go through the steps above twice. To set up advanced options like item modifiers (e.g., small, medium, large), inventory management, and tax rates, visit Items. You can reorder sections and items within sections, as well as delete sections and items within sections. Visit Site Editor and hover over a section. Drag and drop the sections in the list and save your changes. Go to Site Editor and hover over the item you’d like to edit. To delete the item, click the trash can icon. To rearrange the order of items, drag and drop an item to a new location in the section. Go to your Store Settings. Under Site Status, toggle on or off Visible Online and Accepting Orders. To see your customer-facing store, click View Store in Site Editor. To change your URL, head to your online Square Dashboard, make your edits, and click Save. Make sure to update your URL in any other places you’ve shared it (e.g., Facebook, your business card, etc.). If you already own a domain (e.g., noahspizza.net) purchased from a third-party provider, you can link that domain to your Online Store. You can configure a third-party, custom domain (e.g., noahspizza.net) or a subdomain (e.g., store.noahspizza.net) to point to your Square Online Store. If you do this, your Online Store will replace any content currently shown at that address. Although you can’t register domains or subdomains directly through Square at this time (you’ll need to sign up with a domain provider such as Google, 1and1.com, Bluehost, GoDaddy, etc) you can choose to purchase a domain from Google via your Square Dashboard. In order to use your third-party domain for your Online Store, you’ll need to edit your DNS records. Contact your domain provider for instructions on how to do this. Note:If you purchase a domain through Google via your Dashboard, you do not need to edit your DNS records. Once you access the DNS record, make a configuration change. The format of your existing domain or domain type will determine the configuration changes. Reference the table below to see what changes to make. Visit your online Square Dashboard. Toggle on “Use a custom domain you own” and enter your third-party, site address. Note: The domain shouldn’t include http:// or any trailing slashes or paths. Or click “Purchase a new domain” and go through the purchase flow. Click Test to verify that your domain is valid and properly configured. It can take up to 24-72 hours for Square to see the changes you’ve made. You can offer multiple delivery options to your customers, so they can choose how they’d like to receive an order. When an order for electronic delivery is placed, a confirmation email is sent to both you and your customer. Electronic orders process and complete automatically until you run out of inventory, meaning you don’t have to manually mark an electronic order as complete. To ship orders, customize your shipping settings and turn on the shipping option for items you’d like to ship. Go to Site Editor in your online Dashboard and select an item. Select Shipping as a delivery method > click Save. Visit Store Settings in your online Square Dashboard. Under Shipping Cost (Per Order), select Flat Rate and add a price or pick Free Shipping. Use a shipping calculator to estimate your shipping costs. Under Ship Within, select the time it will take to prepare, ship, and complete orders. This time dictates how long you have before an order expires and the payment is automatically refunded to your customer. You must ship and manually mark the order as complete within this time window. Visit Site Editor in your online Dashboard and select an item. Under Additional Item Shipping Charge, add the extra cost. It’s good practice to indicate the destinations you ship to and specify which carrier (e.g., USPS, UPS, FedEx, etc.) you’ll use for shipments in each item or ticket description. To give customers the option to pick up their order, you’ll need to customize your pickup settings, set your business hours, and select the items you’d like to make available for pickup. Go your Site Editor in your online Dashboard and select an item. Select Pickup as a delivery method > click Save. Set your business hours in Store Settings and customize pickup instructions for your customers. Schedule Pickup for Later: Customers can place orders in advance to be picked up at a preferred time and date. Same-Day Pickup: Customers can place orders within business hours for pickup as soon as preparation time passes. Automatically Accept All Incoming Orders: Switch this off to manually review each order before accepting. Manually reviewed orders must be accepted within 1 hour. To make items available for pickup, Once you’ve created your store and made it visible to customers, learn about managing online orders and review answers to Online Store frequently asked questions.